Eskdale a quiet place to climb. Eskdale has some of the best climbing in the Lakes, with access to Scafell and all the surounding crags. Also the valley has several fast drying crags, including Hare Crag which has some excellent bouldering, as does Fell End just above Fisherground. Linbeck crag has many routes on sound rock and is near the road. 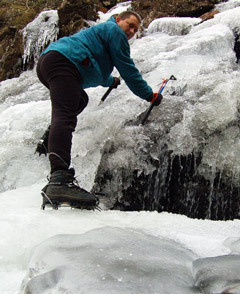 In a good winter Eskdale provides well for the mountaineer with grade 3 ice forming on several waterfalls. The gullies and buttresses of Scafell and The Pike are within easy walking distance, and Wasdale is only 20 minutes drive from Eskdale Green. The valley has lots of scrambles including the classic 3 star route up the Eskdale Gorge. This is a great day out but you will get wet unless it has not rained for about 3 months!. Easier routes include Cow Cove Beck which starts with a hard pitch, this is best avoided unless quite dry, but the route from there is good and can form part of a circular route or as an interesting way onto the Scafell range. Birker Force is a grade 3 and quite exposed near the top, a rope would help. Many of the crags in the area have excellent routes which can be varied to depending on the weather and ability.